There is power in words, never so prevalent as when words are put into writing. There is a permanence to writing which amplifies the power, but I believe there is even more to it. It’s something about the thought which goes into the writing. When we read someone’s story in a book, a letter or a journal we are often reading thoughts the writer has meditated upon for great lengths of time. We are seeing a picture of the writer’s soul. The school year is coming to a close, and my boys are bringing home materials by the backpack load. 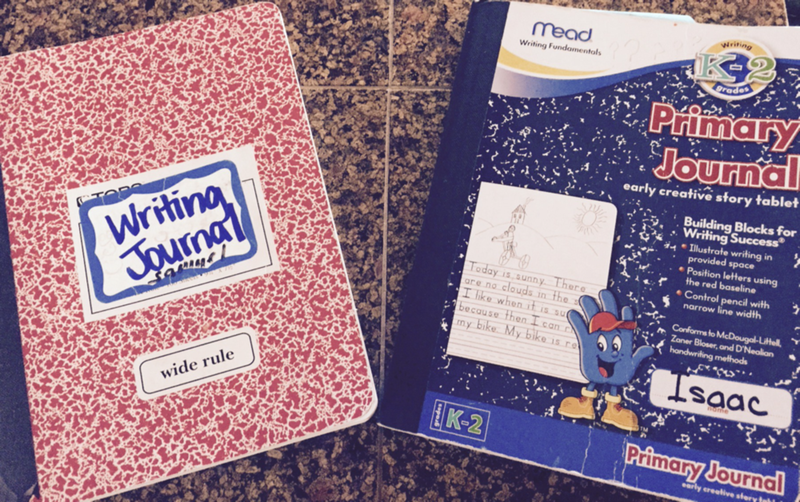 This week, their writing journals came home with them – little pictures of their souls. “Dad, you wanna read my journal?” Samuel asks. I explain this because I understand how my response looks from a distance, and I want you to know your assumptions are inaccurate. I really do love to read my boys’ writing. There might be a few things I enjoy more, but frankly, I can’t think of one. “Are you reading the whole thing?” Samuel asks, noticing I’m giving the journal far more than a courtesy glance. “I like long,” I say. I did read the whole thing. I read it, and I laughed as wholly and purely as I have ever laughed, and I wept the sort of tears one weeps when overwhelmed by the seismic beauty of a sunset over the ocean. I read those words, and I saw my boy’s beating heart. Then I moved on to my younger boy’s journal. While Samuel mostly writes detailed accounts of life’s adventures – family trips, holiday get togethers and such – Isaac is more of a bullet point guy. His journal entries are succinct and unweighted by colorful wording. Isaac has a tendency to say precisely what’s on his mind (much to his parent’s chagrin), and his writing is the same way. Isaac’s writing teaches me a lesson. A significant portion of his journal contains data of two butterfly larvae being raised in his first grade classroom. Entries written over the course of fifteen days detail the food the larvae ate, their growth progress, changes in their appearance. So much time and energy was expended in bringing these creatures along, expended in order that a group of first graders might witness the magnificent transformation of larva to butterfly. I wept for that little larva, and not because I’m a lover of insects. It’s Isaac’s writing. It’s what happens when a writer keeps his descriptions sparse, then tosses in a dash of spice. Two words – Sad and Little – cut me deeply. 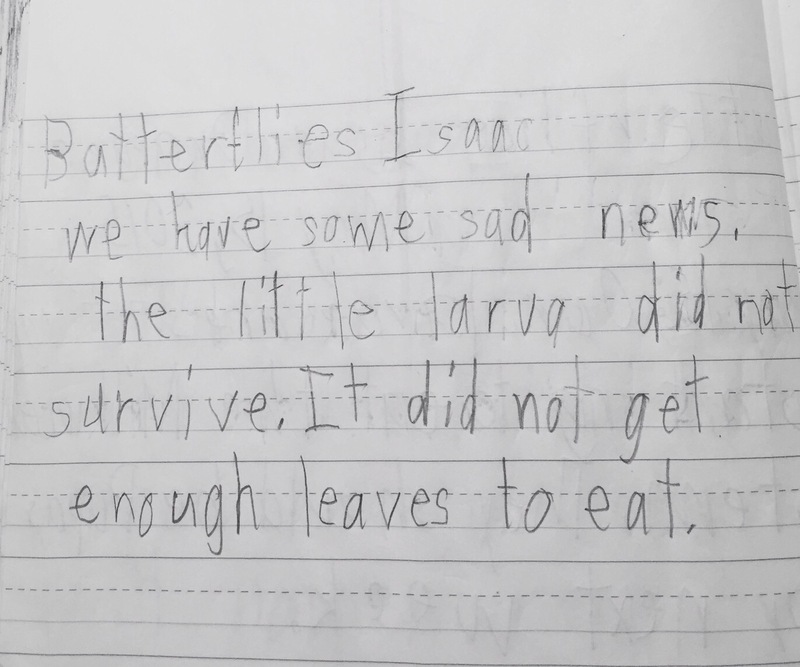 In that moment, Isaac was disappointed over the fate of the larva, and thanks to his writing, I shared his feelings. Few things are so powerful. So kind of you to say that, Diana. Thanks. OMG…..those words hit me right in the stomach. It is the way he used them, they where undressed, naked words that will stick to me for a very long time. I wish I could express myself like that. English is my second language and I struggle everyday to find the words, this little guy is phenomenal! Beautiful, Lucas. And happy Father’s Day! This is beautiful, I popped over due to Diana’s Friday Pick and I’m sticking around. I went right ahead and pressed that follow button as this post really intrigued me and I loo forward to reading more of your wonderful words.